"Large-format art for Interior Design | graphic and photographic | enhancing spaces." Rica Belna, Austrian, has called Berlin, Germany her home since 1993. At the age of 16 Rica started to explore photography. 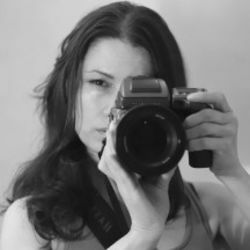 This initial interest and involvement in photography as a hobby, led to Rica’s full-time artistic work starting in 2004. In 2006 Rica switched to digital photography, which opened up an entirely new venue of artistic and creative work. She now uses DSLR and medium format cameras. The opportunity to aesthetically affect Rica’s work provides great possibilities and capabilities in her creation of large format artworks. In addition Rica developed original photo-techniques, which produce the unique style seen in her photo-design works. Latest developments in digital cameras, image editing and printing processes directly support the top quality requirements Rica puts in her art, as well as her preferences for working on large size imagery in her assignments. She says: “My creative potential grows with the possibilities that come my way”. Starting in 2008, Rica has been developing unique photographic designs and new graphic design techniques for large-format printing. These pieces have been up to 25 meters long (approx. 75 feet). Many of these artworks have been installed in 5-star hotels, office buildings as well as wellness-resorts. "I don’t have a favorite material or medium. Materials seem to come to me. I play with them, without a goal, just for fun. This allows me to explore opportunities, being curious to see what evolves. I feel it is important to remain open for new developments, let creativity and the artistic process flow freely. At some point then, there is this moment where something special was created, that touches me, excites me. At that point I get focused: I develop a technique and work it further to create my unique style." "When it comes to abstract art, I assume each person will have different feelings and create their unique associations with what they look at. I want my viewer to have that freedom. I hope that my artworks will touch the viewer and be a positive inspiration for them, maybe also create engaging, interesting thoughts, some type of fruitful intellectual tension. I believe art is important in allowing and supporting such new thought-processes." "There are many things that inspire me and jog my creativity: they could be simple details, such as the colors of an old, peeling wall, or light reflecting on water. It isn’t the visual style of what I am looking at, but rather what it triggers in me: feelings, memories, new associations, or a vague sensing. New images appear in my head, my brain starts to flow like a fountain. There is a need inside me to create, to explore, to try out, to let new things happen." "Spaces that are “special” are quite unique in their own way. Some allow you to calm-down, relax, others energize you. Each space (e.g. hotel, workplace, healthcare setting or home) has its own intended function and if executed well, including the art I create for the space, it will do just that." "While not unique per-se, one aspect that ties my art together is my working in grand-format, with the goal to make spaces feel, or be experienced as expansive, as larger. My art helps clients in creating an open, welcoming, positive atmosphere for the occupants or visitors of a space. This function of my work seems to be useful and I feel blessed to have been able to contribute to interior designs in hotels, workplaces, healthcare and residential settings in the US, Europe and Asia." "My creative process in creating abstract art is quite free-form. I experiment with materials, colors and visual styles. A specific artwork might reveal itself to me, as I work on it. In photography the approach is often more planned: searching for or knowing the location and subject I want to shoot, or type of light, or shapes I want to capture. Once there, surprising elements can present themselves and add to the new visual creation." "When outside in the public realm, doing my artistic work, I often use my camera in ways that must seem surprising or “crazy” to passers-by. On several occasions people have come up and asked me with curiosity and also with sincere concern about “what” I am doing (questioning my mental sanity I assume), or of what I am taking a photograph. What is it that I see? Funny!"